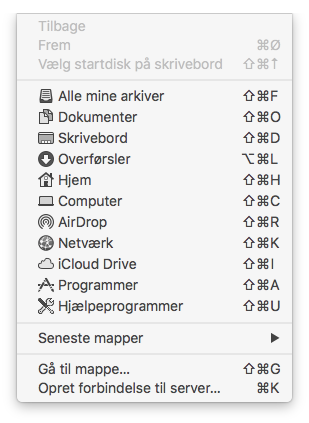 You can find the Finder in your Dock or by searching for the Finder in Spotlight Search. You can also just press the cmd + K key combination instead. Enter the address of the FTP server. The address is just ftp:// followed by your domain name and press "Connect". 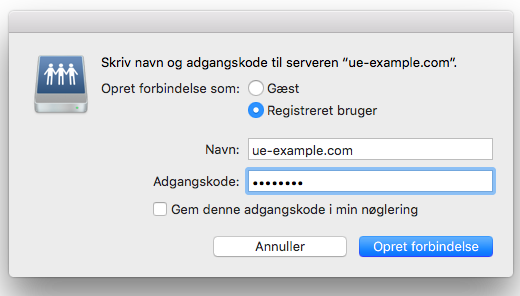 If the picture below says ftp://ue-example.com, but ue-example.com is just the domain name we use as an example, and of course you have to write your own domain name instead. Put Connect as: to Registered user and enter the username of your FTP forName:. User name is the domain name of the web site you connect to. If your webhotel has the domain homepage.dk, the username will be homepage.dk for example. If you do not know the password, you can log in to our control panel, click on your web site and go to Login Information. There you can reveal the password for FTP by typing the code for your UnoEuro account. You will now be able to access FTP through Finder on the left under "Common".